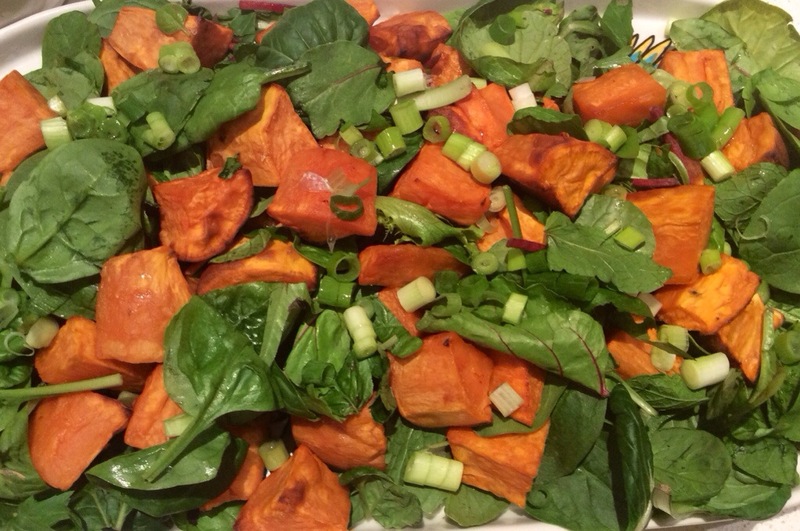 Given you all know how much I love sweet potato, here is another way to have it! I made this salad a month or so ago to take to dinner at a friends, place and I make variations of it all the time. I really liked the mixed herbs I used for the dinner party (Thai basil, basil mint & coriander) but sometimes I do it with just English spinach leaves. It’s the kind of salad that’s keeps well and can be eaten hot or cold. Chop sweet potato into desired shapes, toss in coconut oil and sprinkle with salt. Roast in oven at 180C/350F for about 30-40mins. Cool slightly. Toss with the rest of the salad ingredients. Mix all ingredients in a jar, shake well and pour over salad immediately.